One of the story lines leading up to the Super Bowl was the enthusiastic play of Carolina’s quarterback Cam Newton. Every time he scored a touchdown he had a special dance that he enjoyed performing. Some people took offense at his display of exuberant emotions, but others saw it as a part his passionate personality. I am writing about this not to drawn any moral judgment to Cam Newton, but rather to how emotions can rule our lives. Cam Newton strikes me as a person who rides the roller coaster of emotions to the fullest extent. When he is happy and excited, he revels in the emotion. When he is disappointed or crushed, he let it all hang out. This is such a sharp contrast to what I learned growing up. I was taught (in both overt and in subtle ways) that to show any emotions was not appropriate. I came out of a stoic Norwegian culture that emphasized staying in-control. It was not appropriate to ride the roller coaster of emotions; keep an even keel and a pleasant smile. Don’t let my highs get too high, nor my lows too low. What I have come to discover is that neither path works very well. I have at time chosen to ride the emotional roller coaster, but the ride can overwhelm my inner being and good judgment. I have done and said some rash, harsh things to friends and family in “the heat of the moment.” I have allowed self-pity to rule my days in destructive ways. But to ignore my emotions can be just as destructive. To bury my anger or ignore my disappointments can be just as destructive. They tend to cause internal stress that calls for attention. More recently I have practiced a middle way. I acknowledge whatever emotion I may be feeling: anger, disappointment, hope, joy, fear, sadness, but I do not let it rule my judgment. I observe how the emotion may be affecting my body, my breathing, my outlook, but I hold it at a distance. The emotion is certainly real, but it is not in control and it will dissipate over time. I step back and observe what my “reactive behavior” might be and discern whether that behavior would be helpful in the long run. It usually will not be. I don’t bite my tongue, but I certainly hold my words for a moment. This is a practice of mindfulness. I imagine it as part of my dressing myself in Christ. This entry was posted in Joy, Spiritual Emotions, Uncategorized and tagged Cam Newton, disappointment, emotions, patience, Super bowl on February 9, 2016 by Pastor John Keller. I have been writing recently about spiritual emotions. Today I rode my bike to church and with the ride came a variety of feelings. First came the excitement of doing something new. I had talked about making the 28 mile trek from home to Resurrection all last summer, but never did it. This year I felt this internal drive to make it happen. So as I prepared my water bottles and look over the route, I had a mixture of joy, anticipation and excitement. The joy and excitement stayed with me during the first twelve miles of the ride. It was a beautiful morning, cool with a slight overcast. Part of my journey was along a paved state trail, a converted railroad bed, that was sheltered and tree-lined. I felt like a kid set free. Then at twelve miles, a new feeling rose up within me. I could feel my back tire going soft and disappointment crept into my heart. “No, Not a flat tire. Not today! Not on the way to work,” I thought. And I simply panicked. Even though I had changed my bike tire, it had always been with more experienced riders who could assist me. Thinking I could not do it on my own, I phoned my wife and asked her to rescue me. While I waited, I decided to work on changing the tire. And within fifteen minutes, I had the flat fixed. Now my emotions shifted again, from disappointment to that of satisfaction. “I can fix a flat!” But my wife was still on her way and she was not answering her cell phone. So I waited, impatient and also apologetic. When she arrived, I was feeling a bit embarrassed that I had called for her assistance. When she arrived she responded graciously and I felt some relief and peace that I could complete my ride. The rest of the ride went smoothly except for one instance. As I entered Woodbury proper, the traffic increased and I had to be quite mindful of various cars and trucks at intersections. Approaching one traffic light, a male passenger yelled something at me through an open car window. I felt this immediate irritation at being accosted. I believed that I had every right to be there. The car had stopped at the intersection and I bicycled by it. As I passed, with irritation I said to the passenger, “I have every right to bike here.” He just gave me a strange, disgruntled look and I rode on. I then reflected on my feelings of irritation. Was I going to let this one momentary event color the rest of my ride? Would I allow this irritation to grow to full anger? Emotions can be ridden just like a bike. We can brood on some feeling, deepening its intensity, or we can let it go, seeking new emotions to ride. 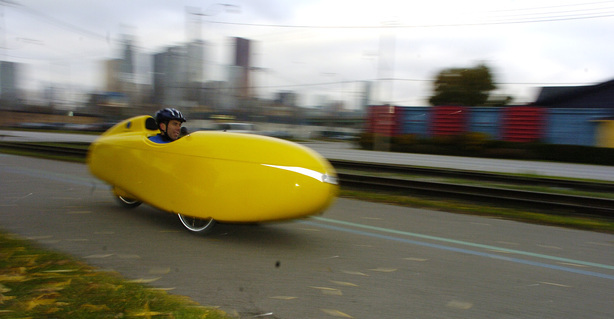 Fortunately, I caught sight of a unique vehicle, a recumbent bike with a full bright-yellow wind frame around it. With that flash of novelty, I happily finished my ride to church, feeling a new sense of accomplishment. Lord Jesus, take the rough edges of my heart and mold them to your desires. This entry was posted in Body Mind Spirit, Joy, Resurrection Lutheran Church, Spiritual Emotions and tagged bicycling, disappointment, irritation on June 7, 2012 by Pastor John Keller. A couple of weeks ago I wrote that I have been unable to run pain-free since last spring and that I started a new round of physical therapy at Focus Fitness. (see MAT to PAT http://wp.me/p1e1iu-6A ). Their staff is helping me to address the muscle imbalances I have developed by a series of exercises that activate weak or inhibited muscles. Every day I attempt to do these awkward exercises, concentrating to keep the right form and to activate the appropriate muscles. It is a definite mind-body exercise and I feel very foolish as I do them. Of course, last week, I had to try a short run to see if these exercises were having any desirable effect. I hopped on to a treadmill and started first with a brisk walking pace and then pushed the pace higher to a slow jog. I quickly discovered that my left IT band and right hamstring continued to complain. I backed off the pace and stepped off the treadmill, disappointment hanging from my shoulders. I had hoped for some instant relief. But instead of running, I am back to the awkward exercises every morning and evening. I continue to think there is a spiritual lesson for me to learn. How often do I treat prayer as an instant relief button, hoping that God will magically answer my wish? How often do I trust the process of praying patiently for God’s will to be done as I keep my focus on Jesus? How often am I disappointed when things do not turn as quickly as I envisioned? Also I know that many people feel awkward when they try to begin a spiritual discipline of prayer or scripture reading. They are unsure whether their prayers are having the desired effect in their life or if they understand what they are reading. Just like I needed a therapist to help me identify and work the weak muscles, a small group or spiritual mentor can help us begin a new spiritual journey. Is your spiritual journey flourishing, struggling or maintaining? Where do you discover Jesus? This entry was posted in Beginnings, Body Mind Spirit, mental exercise, Physical Exercise, Prayer, Running, spiritual exercise, trust, Uncategorized and tagged disappointment, Fitness Focus, hope, prayers, Running on February 23, 2011 by Pastor John Keller.